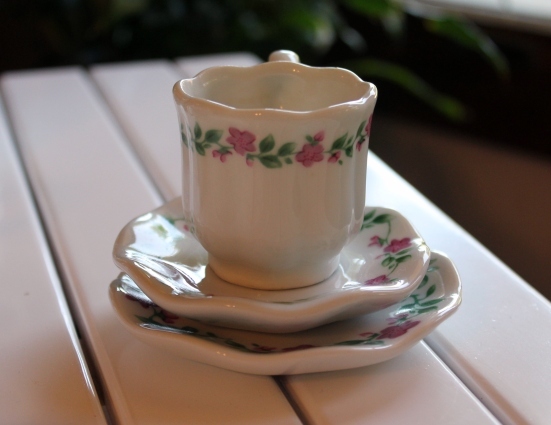 This is the Little Tea Set the girls would use to 'Take Tea' when they came to my house when they were small. When the girls are visiting we have Tea in grown up teacups. I wanted to share this Little Tea Set with them while they are visiting. And hopfully they will remember the special times we had together when they were younger. I had this tea towel in My Cozy Corner shop And now I'm enjoying it so much since I brought it home. 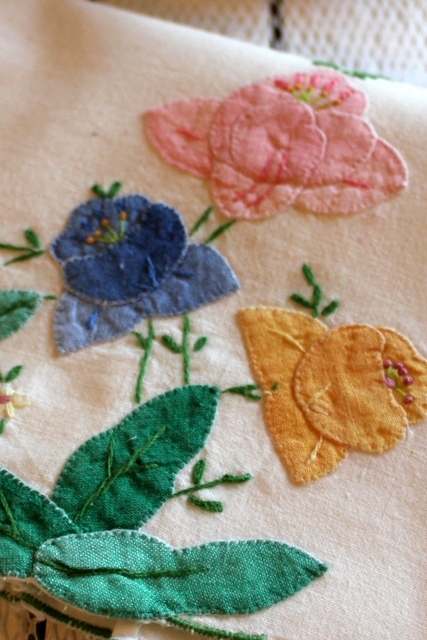 I love the applique on the vintage linen. 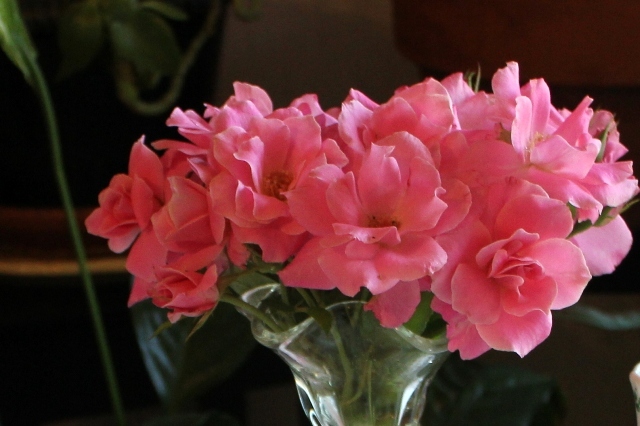 And, it's nice to have a little pink for Pink Saturday. 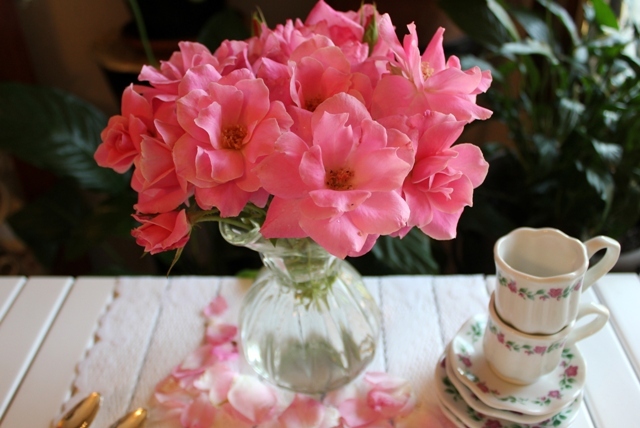 The bouquet of roses is called 'Simplicity' and a few blossoms fell on the table. ﻿So soft. 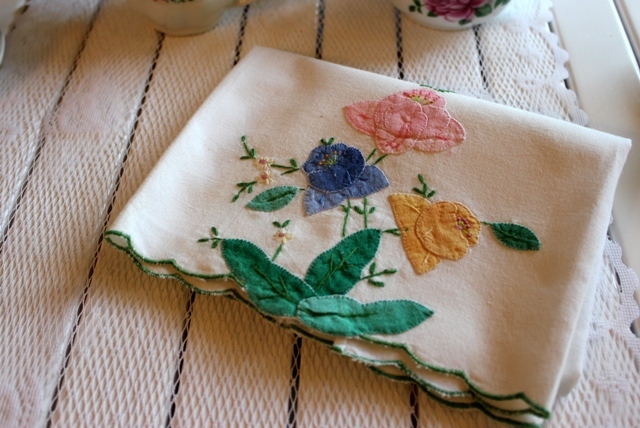 I also have this darling table runner from my days in the thrift store business. 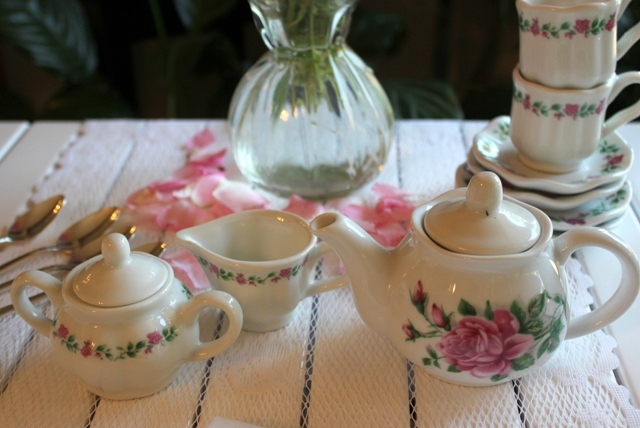 The Tea Pot is just perfect for today's post. The girls didn't drink tea as small children. The game was that I would put water in the pot and fill the sugar bowl with sugar cubes and it was game on!! Sweet pink flowers on the tiny cups. I put my demi spoons on the table to keep the proportion harmonious. Have you have enjoyed your visit? I sure have enjoyed playing in My Cozy Corner. Hi Betty! What a sweet post and the tea set is so lovely! You've set up just the perfect little spot! this is so sweet. 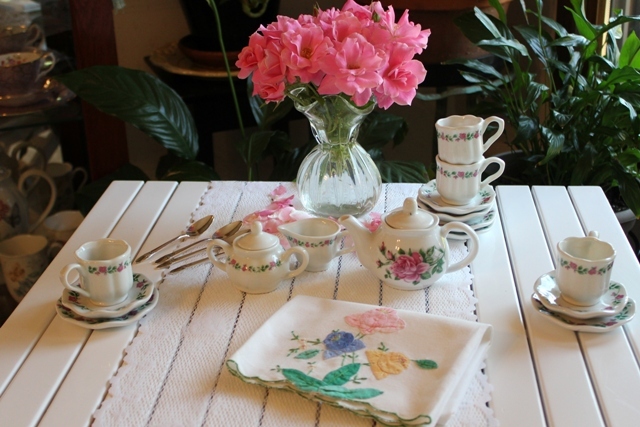 Would have loved to play tea time with such a cute chine set. Your granddaughters are blessed with the nicest Grandma. 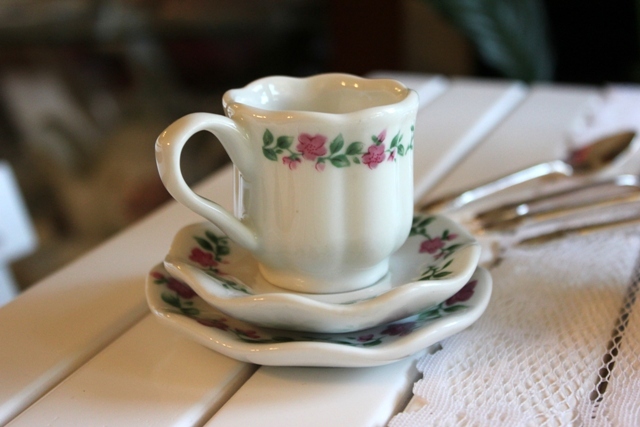 Your miniature tea set is adorable and I bet the girls have fond memories of having tea with Grandma. 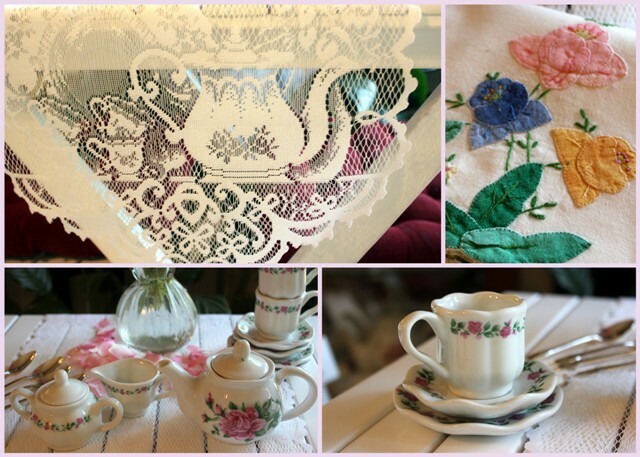 Your lace table runner with the teapot is exquisite. I will have to keep my eye out for one. Thank you for sharing your lovely table with us. 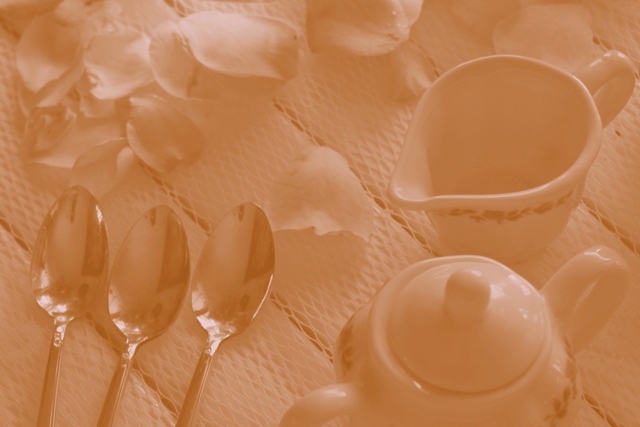 Oh what a darling post - love the children's teaset! 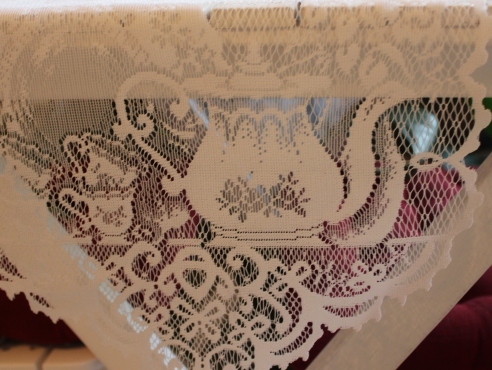 Loved the family ties around teatime1 That runner looks like Heritage Lace from Pella, Iowa. 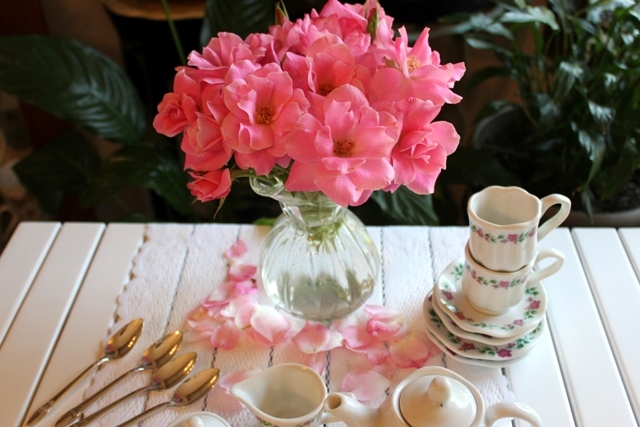 I love your tea time setting, it makes me feel like a little girl again, thanks for that. You are so lucky to have granddaughters! I have a tea set all ready for the first girl born to the family - but we'll have to have tea at Nana's once before she takes it home. I'm sure one look at the tea set will bring lots of warm and happy memories back. What fun to have so many grandgirlies so close in age. 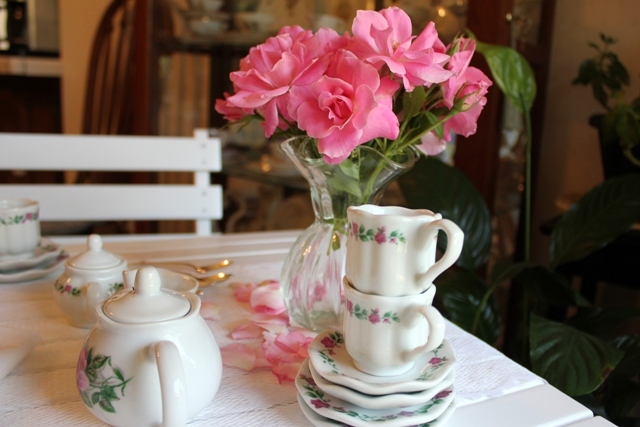 Sweet little tea set...the color of those flowers is gorgeous. Such a sweet tea set. I really love that runner. Lucky you to have so many grandaughters. Thanks for being a part of Seasonal Sundays. 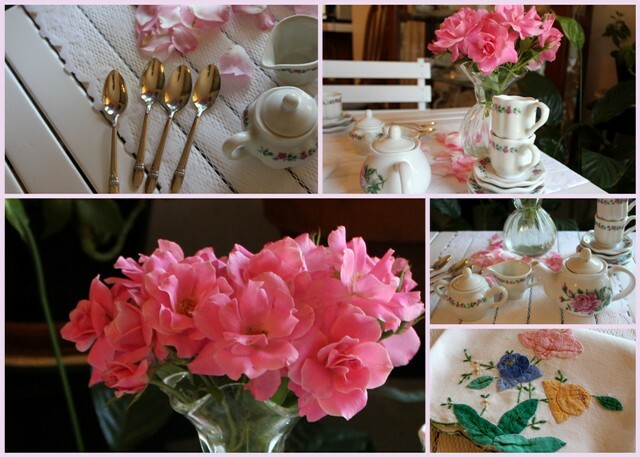 What nice memories your granddaughters must have of "taking tea" at your home. 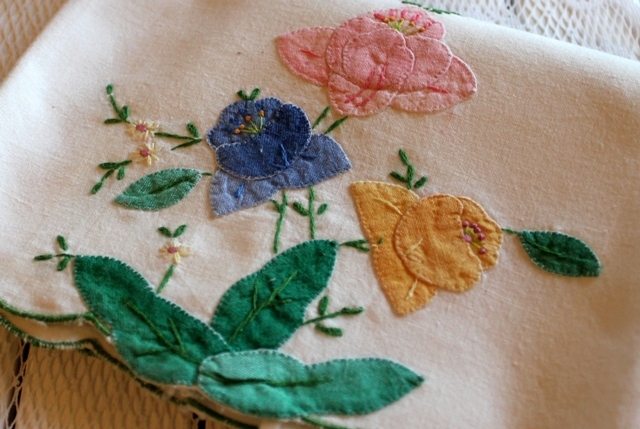 The set is so pretty, as is the applique work on the tea towel. Im really lucky to find you post! You are surely doing a right thing. After carefully reading, I find that your article interest me. Do you drink Chinese Tea as me? Where you usually get your tea and teapots? Local mall or tea related websites?